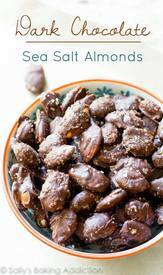 For a healthier chocolate treat, try these sweet and salty dark chocolate sea salt almonds! Only 4 simple, convenient ingredients transformed into something extraordinary. And within minutes too! Plus, they’re a good source of protein, energy, and let’s not forget all that glorious sweet and salty crunch. Mmm. Seriously, make these today.